John J. Pempek, Inc. provides a wide range of industrial electrical services for your Chicago business, including industrial conveying systems services. If you need your conveying system installed, moved, repaired or maintained, contact us today through our website contact form or by calling (708) 361-1265. 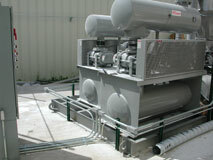 Our electrical services include both dense phase and dilute phase conveying systems services. Dense phase conveying has a high solid-to-air ratio during the conveying process. This system conveys products gently and uses less power to run, without moving constantly. Because of this, the machinery works better longer. This type is better for certain varieties of products to keep them from being separated or from deteriorating. Dense phase conveying works well for processing food and manufacturing. It is recommended for products like fine powders, granules and similar materials, such as sand and graphite black. Opposite from dense phase conveying, dilute phase conveying has a low solid-to-air ratio. You will use this type of conveying system for many types of powdered and granulated materials in a variety of industries, including food processing, chemical processing and manufacturing. Dilute phase conveying provides non-stop movement. These systems can convey most materials. For instance, you might use them for food products like flour, sugar and gelatin, and for manufacturing materials such as PVC pellets. Count on John J. Pempek, Inc. When you work with John J. Pempek, Inc., you will gain the experience of an expert conveying system contractor. Our contractors can provide simple and complex support and maintenance for your conveying systems in any industry. We have worked on these systems in the food service, manufacturing and other industries, so we can handle your specific machine and its purpose. Our experienced contractors will provide high-level services you can't expect from every company. We can install, repair, maintain and relocate your machinery. We also go beyond the basics with our services, helping your system work more efficiently within your entire electrical system and updating older machinery if necessary. Plus, we provide emergency services 24 hours a day, seven days a week so your company can keep running. At John J. Pempek, Inc., we provide flexibility with our services to fit your Chicago company's needs. You can have an on-call or temporary contractor for problems here and there, or have a full-time person to help with your ongoing needs. Even if you have staff for your systems, we can provide extra support when your staff is low or during times of heavy maintenance. Call us at (708) 361-1265 or fill out our website form when you need a conveying system contractor.